The Out of Round attachment fits standard sizes of Sawyer Compact and Quick Set beveling machines, and makes cutting and beveling out of round pipe possible. The Sawyer Compact Beveling Machine is the heaviest saddle machine in the industry and delivers precise, consistent pipe cutting and beveling. Sawyer’s line of pipe beveling tools features the largest saddle machine sizes in the industry, with 10 machines ranging from 3 to 60 inches, ensuring a suitable pipe cutting machine is available for any pipe beveling or cutting requirements you may have. The Sawyer Compact is built tough to withstand harsh environments without compromising accuracy, the Sawyer Compact Beveling Machine features steel and cast aluminum construction and a fully enclosed gear box to prevent damage to critical gears. Nothing is worse than a delay in a pipeline beveling job because of inoperable pipe beveling tools, and Sawyer’s dependable pipe cutting machine options virtually eliminates that risk. For supreme adaptability and ease of use, the split frame design of this saddle style cutting and beveling machine allows for easy mounting and placement anywhere on the pipe, and this pipe cutter is adjustable to fit more than one size of pipe or tubing to meet and exceed all your pipe cutting and beveling needs. 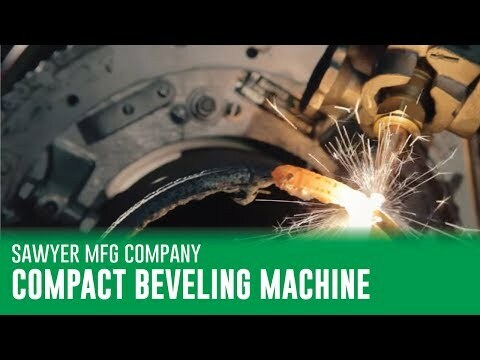 Featuring substantial weight, size, dependability, and accuracy, a pipe beveling machine from Sawyer is always the clear choice.